In the countryside outside of Buffalo, New York, Boston Valley Terra Cotta (BVTC) has an impressive industrial terra-cotta operation—a potter’s studio on steroids, with dust and clay scattered around a relatively calm factory. Since 1996 “Rusty” Raymond Conners has spent his days by the window and among his plants, carving intricate designs in the capitals of columns and the faces of tiles. 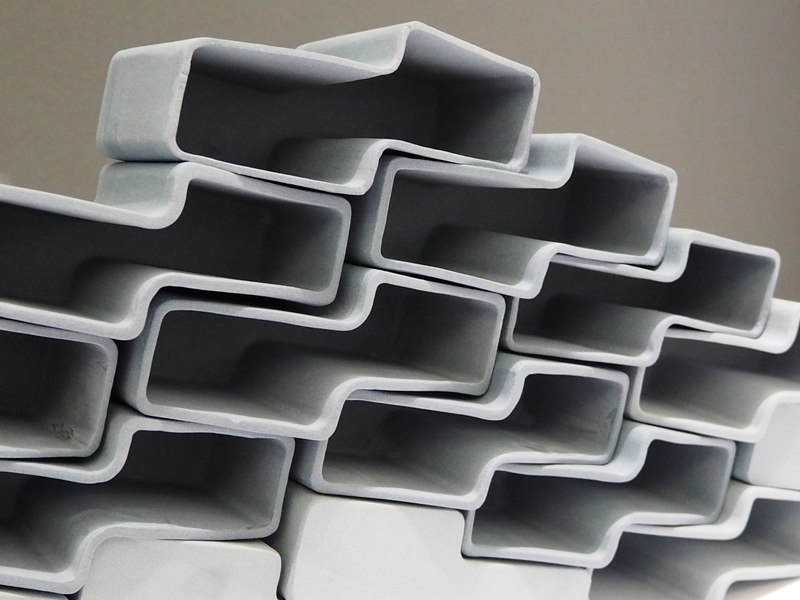 BVTC started in 1889 as a flower pot business, and has since morphed into one of the leading-edge facade manufacturers in the world, producing a range of baked-clay cladding products that are being used by everyone from Machado Silvetti to Morris Adjmi to Annabelle Selldorf. How did this transformation take place? In the last five years, something remarkable has happened. 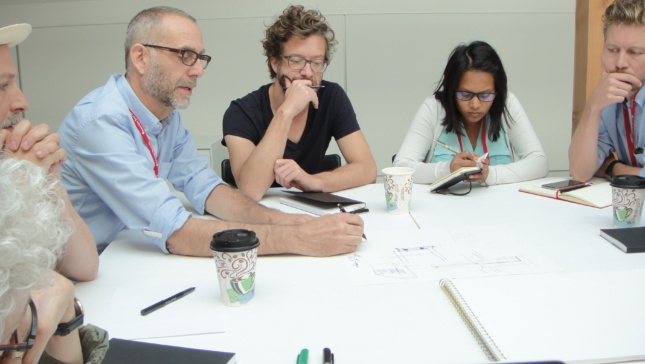 In 2011, Omar Khan, associate professor and chair of the Department of Architecture at the University at Buffalo School of Architecture and Planning (UB/a+p), and Mitchell Bring, a researcher and adjunct professor, realized the potential in Boston Valley’s operation. 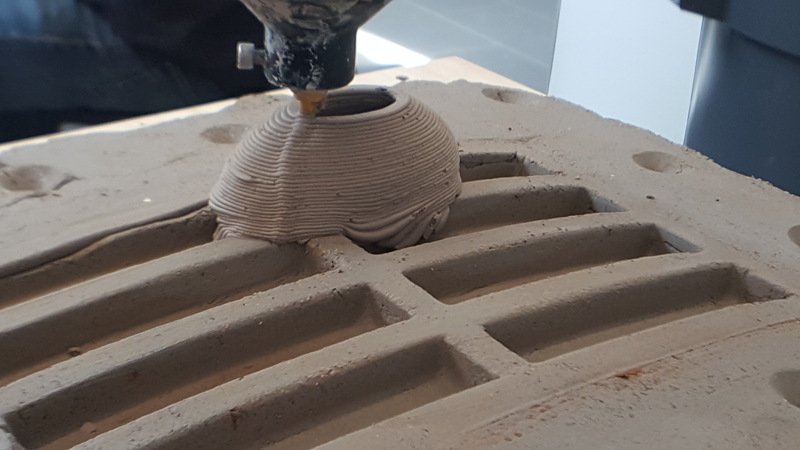 Bring has been working with some former students of UB/a+p to incorporate the latest in digital documentation, design, and fabrication technologies to help BVTC remain at the forefront of the terra cotta industry. What started as a couple of interns is now a whole team of digital designers and fabricators. The digital documentation team uses 3D scan data to enhance more traditional techniques of reproducing historic buildings in preservation projects, such as Louis Sullivan’s Guaranty Building, or New York’s Woolworth Building, which the company is working to restore at the moment. In order to make the process the most efficient, designers use CAD to rationalize the component parts that make up any large ceramic assembly. In a small corner of the factory stands a digital fabrication shop, now led by UB/a+p alum Peter Schmidt. They work with mesh editing software, a 5-axis CNC router, and a 5-axis CNC hot wire cutter to make models that are then translated into molds for the traditional methods such as hand pressing, ram pressing, or slip casting. Some worried that these new tools would cut into the work of the skilled craftspeople, such as the sculptors who hand-finish many of the more intricate pieces. However, once implemented, these artists found that they actually had more time to focus on the part that they really enjoy—sculpture—because many of the mundane tasks were cut out of the process. John Ruskin would be proud. 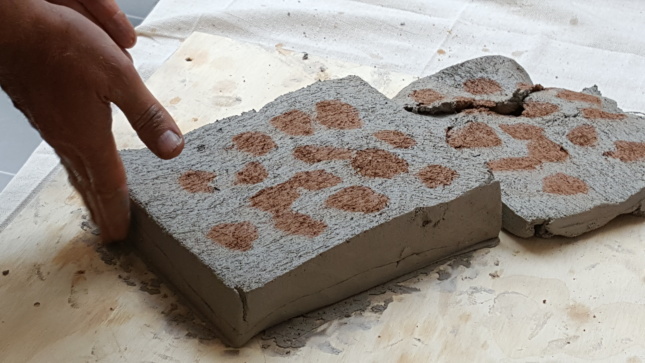 In addition to making traditional techniques more efficient, BVTC and UB are working together to think about how digital technology can allow more experimentation with clay-based building systems. 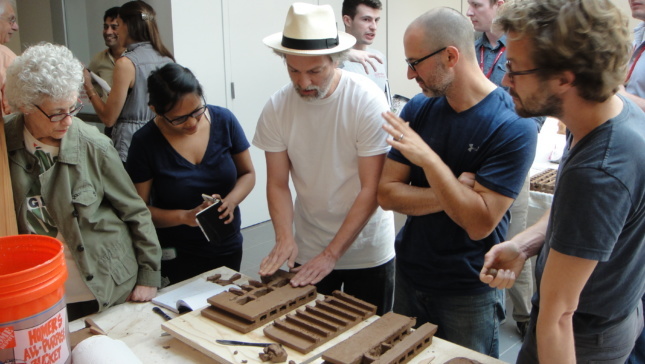 This was the basis for Architectural Ceramic Assemblies Workshop, a week-long conference at UB/a+p, where architects, engineers, artists, and other leaders in the industry came together to share ideas and discuss what might be the future of clay and terra-cotta. The conference was a collaboration of Alfred State University, Albright-Knox Art Gallery, UB/a+p, and Data Clay, an art collective that is pushing the boundaries of digital craft and ceramics. Keynote speakers were Jason Oliver Vollen, architect and principal of High-Performance Buildings at AECOM in New York; Willam M. McCarthy, ceramics professor at Alfred State University; and Neil Forrest, ceramic artist and educator at Nova Scotia College of Art and Design in Canada. Morris Adjmi leads the team in developing “BIO CLAD” at Ceramic Assemblies at the University of Buffalo. What does clay have to offer? What characteristics are unique of clay, and what can it offer that other materials cannot? To explore these questions, the group of nearly 20 broke off into three groups, each with a balance of engineers, architects, artists, and researchers. Throughout the week in the top floor of UB/a+p, they combined their broad collective knowledge with computers, 3D printers, clay, and a range of drawing tools to experiment with clay. Developing BIO CLAD at Univeristy at Buffalo. On the final day, the four groups presented the findings of their charettes and pin-ups. The first group, led by Adjmi, developed BIO CLAD, a panelized system that used the thermal capacities of terra-cotta to enhance the energy performance in residential applications. Terra-cotta panels—TerraClad by BVTC—would collect heat on the outside and run it through a heat exchanger, which would expel it on the inside via a series of radiant heating tubes. Group two presented “Bundled Baguette,” a set of experiments using the baguette, a basic, ceramic tube that is often used as a louver, could be aggregated in several arrangements including a parallel tumbleweed-like cluster. A 3D printer plots clay onto a more traditional terra-cotta form. The third group set out to try new hybridized methods and constructions. They showed an idea that might use raw and fired clay at the same time, with the raw clay acting as a possible medium for humidity control. In another experiment from the week’s workshop, a classic, two-dimensional extrusion is made, with a 3D-printed form grafted on. This would not only be a new technique that hybridizes these tools, but it also would be the first time that a 3D printer would be used for an actual building component, and not just for prototypes or formwork. The last group was the most experimental, and they displayed a range of technical and artistic experiments, including a “mono-clay assembly,” or a complete, easy-to-produce wall module that relies only on clay bodies for performance. Another experiment used three different colors of clay to create a psychedelic extrusion. Different clay bodies mixed together in one extrusion at Ceramic Assemblies workshop at the University of Buffalo. While these experiments were certainly fruitful, for the most part, they were simply conceptual ideas and the prototypes were almost entirely representational. The research—even when rooted in long-running experiments—is still a ways off. That is probably what makes this workshop so important, however. There were no expectations of the week other than to generated ideas, share research, and introduce these practitioners to the Boston Valley enterprise. The caliber of people was matched by the torrent of ideas, and it is only a positive for the future of ceramics in architecture. What is next for Buffalo? What are Boston Valley and University of Buffalo School of Architecture cooking up? To understand what is happening at the nexus of Buffalo’s industrial history, university research, state-of-the-art industry partnerships, and the specified knowledge of ceramics, it is important to start with Governor Cuomo and the Division of Science, Technology, and Innovation (NYSTAR) Centers of Excellence. They have set up eleven of these centers around the state to foster collaboration between the academic research community and the business sector. As part of a larger initiative to make Buffalo a center for manufacturing again, they have established the Center of Excellence in Bioinformatics and Life Sciences (CBLS) at the University at Buffalo. There is an ongoing collaboration as part of the Buffalo Center for Excellence called SMART, or the Sustainable Manufacturing and Advanced Robotic Technologies, which will join forces with the Department of Architecture and the Department of Engineering. There will be a second workshop—supported by Boston Valley—in the late summer of 2017, which will focus less on experimentation and more on advanced manufacturing. Thus the increased number of engineers in the second round, as well as a partnership with a company called BuiltWorld a leader in advanced manufacturing. “The ceramics world is not yet as advanced as far as the digital fabrication world, but that is where we are trying to push it. And Boston Valley is very supportive of this. They are probably the most important manufacturer in the US working with architectural ceramics.” Khan told AN.